It’s difficult for me to narrow down my favorite thing to teach in 1st grade. Some days it is teaching reading, some days it is writing – other days math. Mostly, though, it has something to do with ELA. The simple fact is we cover a LOT of language arts standards in 1st grade and the growth is so measurable! The reward is great for both the kiddos and the teacher! Even after all these years, the growth still amazes me. We do a lot of work with sight words and comprehension – but my absolute favorite part of teaching children how to read is phonics. Phonetic rules make my super organized side very happy. When the spelling structure of word makes sense – it just beyond fabulous. Especially when the kiddos recognize that structure. My kiddos practice phonics in some fashion every single day in a large variety of ways. I have some very specific things we do each week and things we do over a long stretch of time. Here are a few things we do over the longer spans. I always have sentence builder cards available for them during word work. I copy sets on colored paper. Each sentence gets its own color. I only bring out sentence cards based on the phonic rule(s) we are working on. They also work independently on phonic activities that are part of our weekly routine. My kiddos love to draw pictures. I don’t mind giving them “drawing time” because READING is a large part of it! A simple task of blending sounds is fun, engaging and effective. My kids use letter cards, letter blocks and activity sheets for this simple practice. Isolating sounds can be very challenging for some of the young ones, especially English Language Learners. Using sound boxes on scrap paper or white boards is a great way to practice isolating sounds. Draw sound boxes to match your word on the board. Give your students a hint as to what the word might be. Have them use their white boards or scrap paper to write the word they believe you are thinking about. Note their guess must match the sound boxes you wrote on the board. (Sound boxes match the letter size – tall boxes (h, t, f, etc. ), average boxes (a, e, o, u, c, etc) low boxes (g, y, j), use stacked boxes for the letter i. My kiddos love working on sound box activities. “Build a Word” is a weekly staple during independent work. During guided reading and whole group lessons we often work with little readers. We read, re-read, highlight, read backwards, circle and quiz each other about the rules we find in little books. Interactive readers are my favorite! I LOVE that little books can be used in so many ways! They make planning for reading groups quite simple and they keep things moving, kiddos engaged, and schema building! You can’t beat that! Here are a few great questions to ask during guided reading to get the kiddos engaged and involved – and most importantly cementing that phonetic schema! I like to encourage the kids to color the pictures on their free time – it keeps them engaged in the book and looking at words! Often I collect work that we’ve done that indicates they can dig deep and show mastery of new concepts while using the skill in conjunction with others. For example, decoding an incomplete sentence and using rhyming skills to find and spelling the missing word helps me verify that my kiddos not only understand the phonic rule, but are applying sounding out and chunking skills when they read and write. Throughout the year as we introduce long vowels, diphthongs, digraphs and r-controlled vowels I like to keep some sort of similarity in the actual way we practice those concepts. This supports independence, confidence and GROWTH! Our short vowel practice is a great intro to the independent expectation. We use a lot of these activities each week. We begin whole group and quickly move to independence. Our long vowel practice has a familiar look and eases the kiddos into applying their new knowledge to completing these tasks. By the time we get to the last third of the school year, the kiddos GET IT and can easily apply their diphthong knowledge. I want my kids to learn the new academic concept not how to perform a task. Once they’ve made progress on the concept, we can vary the tasks to add some depth and complexity AND allow the kiddos to prove concept mastery. At the root of it all, though, is ownership and application! Mastery of the standards may take a bit of time but it sure is exciting when they achieve it! Opening the door to reading is just amazing! I love being part of this knowledge gain! Card games are some of my kiddos’ favorite word work activities! We have a lot of them. I find that the kids will not only play them as I have directed them – but they change it up! I have card games in all of my phonic resources. Often, we play the games just like Old Maid. Cards are dealt to two or three players, they make matches and pull from the deck until every card has been matched but one “odd ball”. My kids love it, but they will also use these cards to play Go Fish and Concentration. They even use them to build sentences writing the missing words on slips of paper in our word work station! All of the items in this post are from my vowel phonics resources. 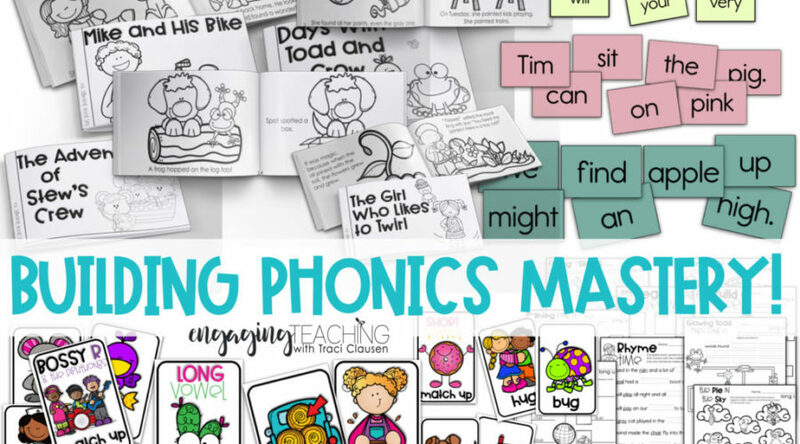 You can get them individually or together in the money-saving Phonics Mega Bundle. I use these three resources throughout the year! The Short Vowel Practice and Review takes us through the first trimester, Long Vowel Practice and Review takes us through the second trimester and Bossy R and the Diphthongs closes out the year! The short vowel resource includes tons of vowel specific activities, 10 sentence cards, and interactive readers for each vowel sound. It also includes a colorful set of cards for a variety of card games. The long vowel resource includes tons of vowel specific activities, 10 sentence cards, and interactive readers for each vowel sound. It also includes a colorful set of cards for a variety of card games. and ar sounds. It also includes a colorful set of cards for a variety of card games. All of the units are available in this deeply discounted MEGA BUNDLE! It has your year covered! So with Vowel Word Work and my Reading Foundations with Phonics series – my kiddos are fully engulfed in the phonics world. These are HUGE supports to our district purchased curriculum and add plenty of opportunity for that all important element of PRACTICE and APPLICATION! Which activity would your kiddos enjoy the most?